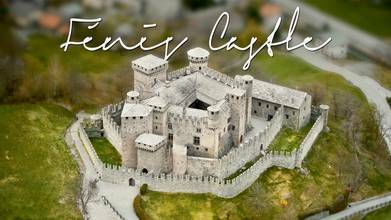 Fénis, Italy is home to one of the most famous castles in all of the Aosta Valley - the Fénis Castle. The medieval castle’s architecture, towers, and battlemented walls have made it a top tourist attraction in the region. Located in the mountains of far northwestern Italy, the Aosta Valley is an autonomous region who’s people speak both Italian and French. Pilot electriclife gives us a phenomenal aerial view of the historic castle. Description: Best of Italy: The Castello di Fenis (Fénis Castle) in the Valle d'Aosta Region, North of Italy. Aerial 4K (Up to 6K) ultra high definition drone video. The Fénis Castle, in French: Château de Fénis, is an Italian medieval castle located in the small town of Fénis. It is one of the most famous castles in the Aosta Valley, and for its architecture and its many towers and battlemented walls has become one of the major tourist attractions of the region, if not the number one. The castle first appears in a document in 1242 as a property of the Viscounts of Aosta, the Challant family. At that time it probably was a simple keep surrounded by walls. From 1320 to 1420, under the lordship of Aymon of Challant and of his son Boniface I of Challant, the castle was expanded to the actual appearance. Under Aymon's lordship the castle got its pentagonal layout, the external boundary wall and many of the towers. In 1392 Boniface of Challant began a second building campaign to build the staircase and the balconies in the inner courtyard and the prison. He also commissioned Piedmontese painter Giacomo Jaquerio to paint frescoes on the chapel and on the inner courtyard. Under Boniface I the castle reached its greatest splendor: it was a rich court surrounded by a vegetable plot, a vineyard and a garden where the lord and his guests could relax. The castle belonged to the lords of Challant until 1716, when Georges-François of Challant had to sell it to Count Baldassarre Castellar of Saluzzo Paesana in order to pay his debts, and for the castle was the beginning of a period of decline. It was turned into a rural dwelling and became a stable and a barn. In 1895 architect Alfredo d'Andrade purchased it and started a restoration campaign to secure the damaged structures. In 1935 a second campaign by De Vecchi and Mesturino completed the restoration and gave the castle the current appearance. The rooms were also provided with wood period furniture. The castle is today owned by the Autonomous Region Aosta Valley, which turned it into a museum. Despite its impressive defensive structure, the castle is situated at the top of a small knoll and not of a promontory or another inaccessible and easily defensible place. In fact it was not built for military purposes. The inner courtyard, at the centre of the keep, shows a semi-circular stone staircase and wood balconies. At the top of the staircase a 15th-century fresco features Saint George killing the dragon, while the walls of the balconies are decorated with images of sages and prophets and proverbs in old French. The interior of the castle is divided into three floors: on the ground floor it is possible to visit the weaponry, the kitchen, the woodshed and the storage tank to collect rainwater. On the first floor there were the rooms of the lords of the castle, the chapel with frescoes by Giacomo Jaquerio and his school and the court. The second floor, in the attic, was dedicated to the servant's quarter and is not visitable.